Living downtown can be ruff, but fortunately, there’s a place where your best friend can kick up their paws and let their tongues hang loose. WOWOW Grooming - which is a children’s word for “dog” in Spanish (essentially, “woof woof”) - is on Main between 4th and 5th (sniffing distance from the Spring Street dog park), and is the creation of Maura Rindelaub and Evelyn Solorzano, two dog-loving groomers who took their expertise and passion to open up their own shop. For dogs, one of the most stressful parts of getting groomed is getting their nails clipped. They have a nerve and blood vessel in their nails called a quick, and if their nails are cut too short they start to bleed. This is where Maura and Evelyn’s sensitivity and expertise really comes into play. Evelyn will massage the dog’s ears and give them love while Maura files down the nails with an electric buffer. “It works like a charm,” smiles Evelyn. Their love for dogs is visible throughout the space. From the incredible dog-focused artwork on the walls masterfully painted by Maura, to the open environment that gives parents complete visibility to their fur babies as the pair works. As if to emphasize the love and care that these two put into their work you will be instantly charmed by Maura’s two dogs, Jurgis and Peanut, as friendly and as approachable as dogs can be. 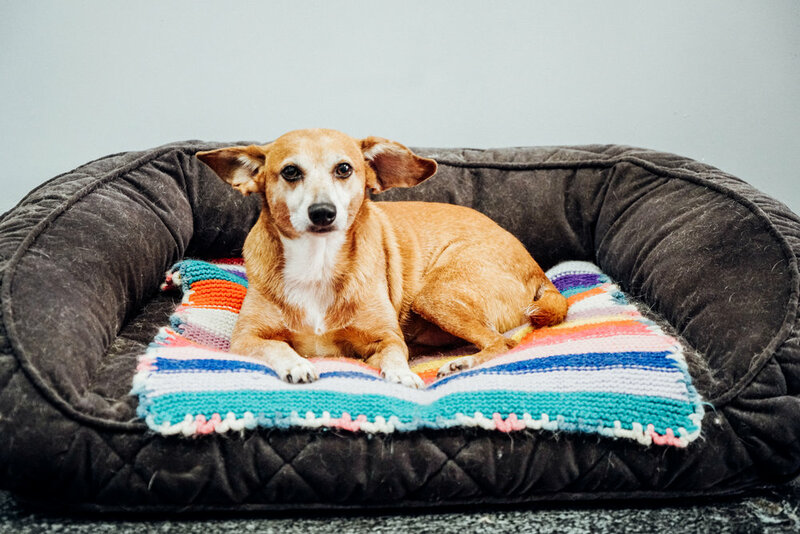 At fourteen, Peanut, a chihuahua/terrier mix, is playful and buoyant. “If she makes it to fifteen we’ll throw her a quinceañera,” Maura jokes.